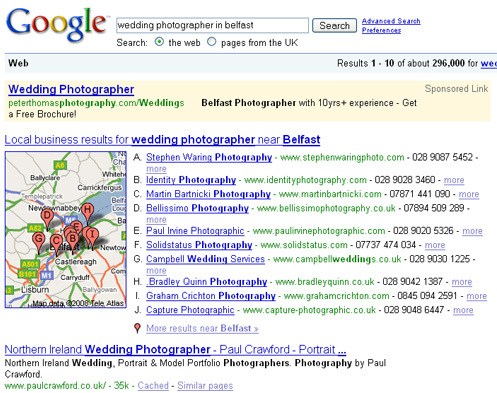 Local Search well and truly arrived with the introduction of the ’10 pack’ listing. At Search Engine Strategies at the start of this year (2009) it was the anniversary of the rollout of this feature in the UK. The recent addition of a dashboard highlighted Google’s commitment to local search and it’s ever increasing importance. The screenshot below is from a short article I wrote on the adding your business to Local Business center. Duplicate content can be a proper nightmare. The Canonical Link Element was introduced to help webmasters and site owners stop duplicate urls from getting indexed in Google. Matt Cutt’s talks about the Canonical Link Element in the following video and blogged about it here. So how does Google treat Canonical Mistakes? Google anounced the new dashboard back in June and now at last it looks like it’s been rolled out for the UK and Northern Ireland results. If you haven’t signed up for a Local Business Account now’s the time to go ahead and do it. If you’ve already got an account log in and you’ll see a ‘view report’ link. Just click on the link and you’ll see the dashboard.